My first attempt at a full smd version of a minimal node. This one is just for testing the combination of an all smd node with a CR1620 battery. Boards were made at OSH Park. Still missing the 1M Ohm pull up resistors and the ATSHA204A (on order). This node now runs as a switch detector node in my Domoticz network. The battery can handle the short bursts of transmission, but can not keep the LED on for more then a few seconds before you can see it dimming. 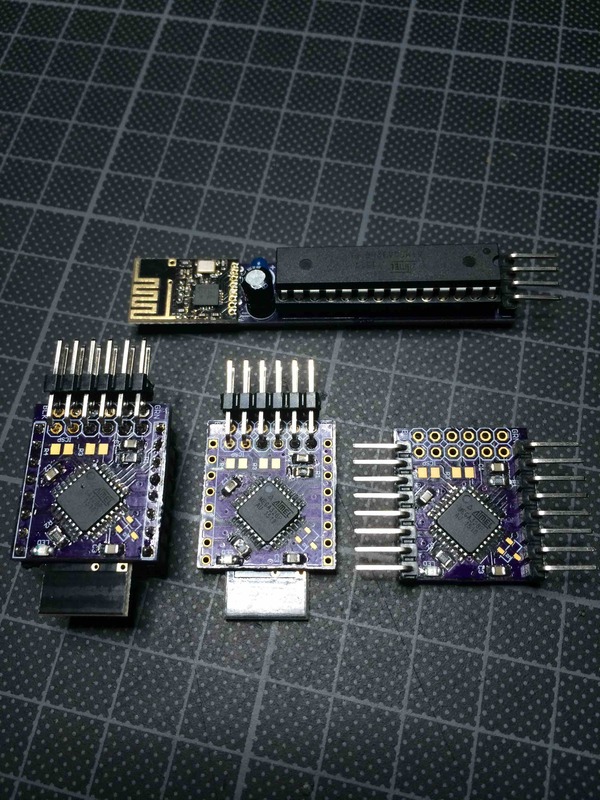 Start with soldering the MCU, the resistors and capacitors, then add the ISP and FTDI header. Program the mcu with the boot loader. Then check with a blink sketch if FTDI also works. After that, solder the NRF24L01+ on the bottom. On each side there are 8 pins which each time include a VCC and a GND pin. Sending of voltage and pin status uses around 19mA for a short while (could not yet measure that timing). Battery capacity is around 130 mAh. With an average consumption of around 10uA, this node should reach 380 days. If that would be true, I would be happy. In any case a year seems possible so I will set this node in a corner and let it signal it's battery voltage every hour. It's a dumb minion anyway, so it should be happy with any task :-).